This entry was posted in Uncategorized on March 27, 2010 by dahlia. The flowers were stamps I made using craft foam and wood. I used Speedball screenprinting inks to paint them. I found it was very easy to shade and highlight the colours as I put the paint onto the stamp, so that I can give the flowers some real depth. This entry was posted in Uncategorized on March 21, 2010 by dahlia. These were so much fun to make! 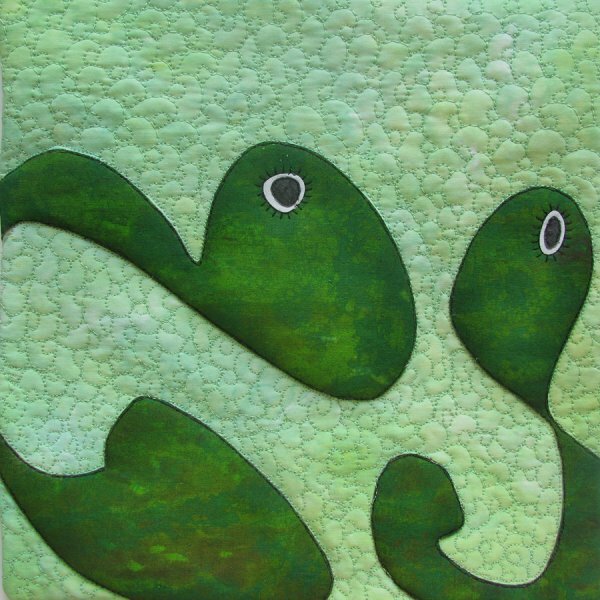 I made a stamp of braided yarn, and used fabric paint to stamp the basic shape of the fiddleheads. Then I used variegated thread, in a free motion zigzag, to add the structure and a splash of brown. This entry was posted in Uncategorized on March 17, 2010 by dahlia. These guys were fun to do. I took a batik fabric, and ironed on freezer paper mushrooms. I applied Presist around the freezer paper, and then removed the freezer paper when it was dry. Then I used bleach thickened with alginate to discharge the mushroom shapes. After the bleach I used a peroxide solution to neutralize it. Finally I used oil pastels to subtly shade them, and ironed to set. This entry was posted in Uncategorized on March 6, 2010 by dahlia. For the rocks I used Stonehenge fabrics, and a free motion zigzag stitch around them. If I were to do this again, I would add trapunto to the rocks I think. And/or more shading, perhaps with oil pastels. when the snow had mostly melted, I warmed the fabric in the microwave (2 minutes on high) then left at room temperature for an hour. To wash my pieces, I first let them soak in a little clean water for a couple of hours. This seems to decrease the number of washes. Then I wash in cold water, extra wash, extra rinse, with a little synthrapol lf. Then I wash in hot water with detergent for two cycles. This entry was posted in Uncategorized on March 3, 2010 by dahlia. This entry was posted in Uncategorized on March 2, 2010 by dahlia. 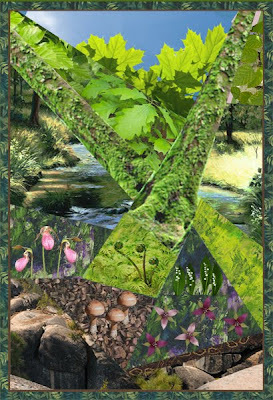 This is the design mock-up for a cubist forest quilt, the final assessment piece for my City & Guilds course. It will be constructed from commercially printed, hand dyed, and hand painted fabrics. Most of the elements will have these fabrics developed further with surface treatments (stamped flowers, leaves, textures). Some of the elements (the stream pieces) will have multiple fabrics pieced together.